After more than 70 years, the Second World War continues to be the most popular subject for scale modelers. German subjects continue to dominate the market and many modelers’ interests. But recently there has been a modest increase in attention to Allied armored fighting vehicles (AFVs) and figures, with U.S. tanks, softskins (jeeps and trucks) and soldiers leading the way. As a modeler, my focus is on the U.S. Army soldiers and vehicles that fought in Europe during WWII and how to recreate them in 1/35 scale. To help promote the modeling of American armor and soldiers of this era, I've created this site to share information and discuss historical features as they pertain to model kits in the market today. 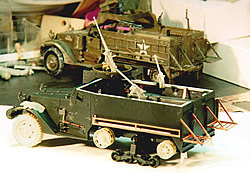 This site is designed to assist people new to the hobby or American AFVs, as well as those more experienced modelers who’ve tired of “everything German” and are seeking a taste of olive drab. This is not the definitive word on the subject, of course, and this site will continue to be a work-in-progress. I hope you will find it informative and helpful in your modeling projects. And if you have any comments or information to share, please hit the Feedback button and drop me an e-mail. Logo Credit: Logo created by Timothy S. Streeter based on Ron Volstad's artwork for DML's "US. 101st Airborne, Bastogne 1944," used with permission of the artist. Photo Credits: Photos of models, vehicles and re-enactors by Timothy S. Streeter © 2002-2006 unless otherwise noted. All rights reserved. 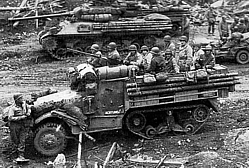 Black and white historical photographs come from the U.S. Army, the U.S. Signal Corps, and/or the United States National Archives. Product names, artwork and trademarks are the property of their respective owners and are used here in an editorial context without intent of infringement. NOTE: All rights to the contemporary photos on this site are held by their respective owners (photographer and/or modeler). 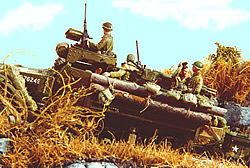 These photos are provided as a service to modelers for their private use. Manufacturers may use them as reference sources without the consent of the photographer, but it is requested that the photographer be informed of such use and given credit as a reference source in any listing of of the manufacturer's references, as on instruction sheets. Manufacturers may not use these photos for illustration purposes, including, but not limited to, instruction sheets, box art (whether as a photograph or as the basis of an artistic rendering), or in any form of advertising or promotion without the expressed consent of the copyright owner. Any questions about this policy may be referred to the Webmaster (see Feedback page).